Best for: Hawaiian based residents, who use Hawaiian regularly. The crowd: A mix of young Japanese trendsetters and families. Business or pleasure: Hawaii is a big market for the Japanese, with limited connectivity and recliner seats, this is for those headed away on pleasure. Routes: Hawaiian has recently expanded heavily into Asia, but is a good one stop-hop carrier across the pacific to the US too. 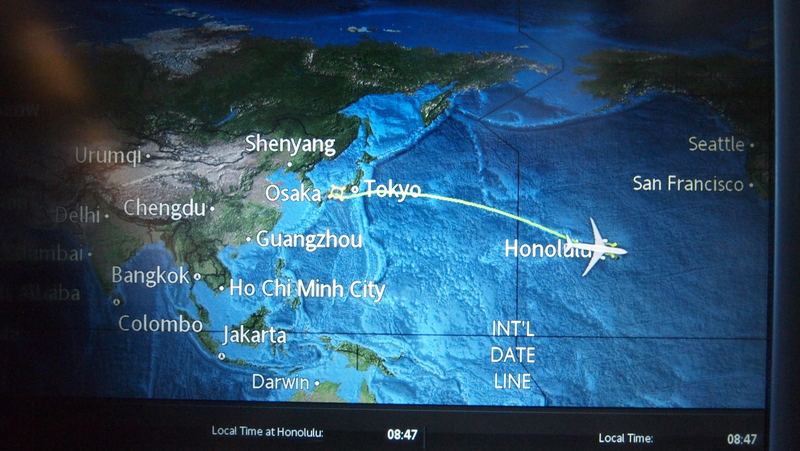 Frequent Flyer Programme: Hawaiian Miles. Very powerful in the state of Hawaii, with many retailers offering miles on purchases. Good rewards tickets too. Best bits: The service is by far the winning element. Friendly, genuine and attentive. 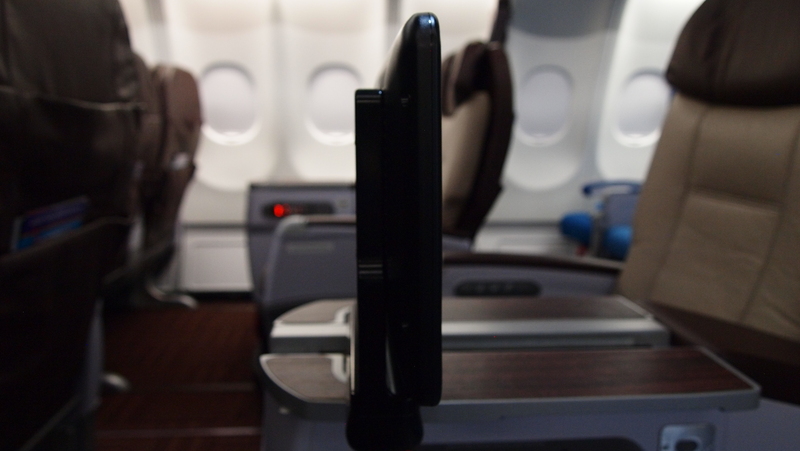 Worst bits: We hate to say it, but the airline needs either lie flat or fully flat seats in business/first (same cabin) to compete effectively with their competitors. On a recent around the world trip, we were lucky enough to be invited to try out Hawaiian Airlines ‘International Business Class’ product, from Osaka, Japan to Honolulu. 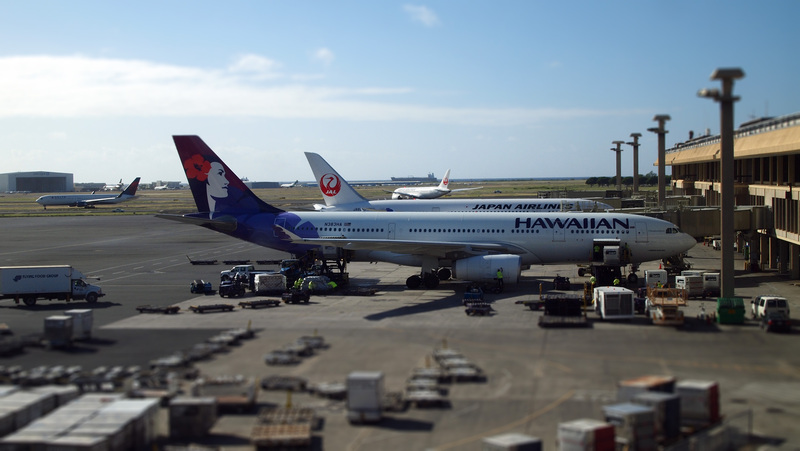 We have previously experienced Hawaiian Airlines First Class product between mainland US and the state of Hawaii, but wanted to see how the product differed on international travel. Hawaiian Airlines has expanded across to many new destinations in Asia, including Beijing this year, of which most have been very successful. The newer fleet of A330 also offer passengers greater comfort and profitability for the airline, making it a secure and reliable airline choice for travel across the Pacific. We arrived early the same morning from a flight with Finnair, so had the day to explore Osaka town. Once the exploration we headed back to the airport on the train. 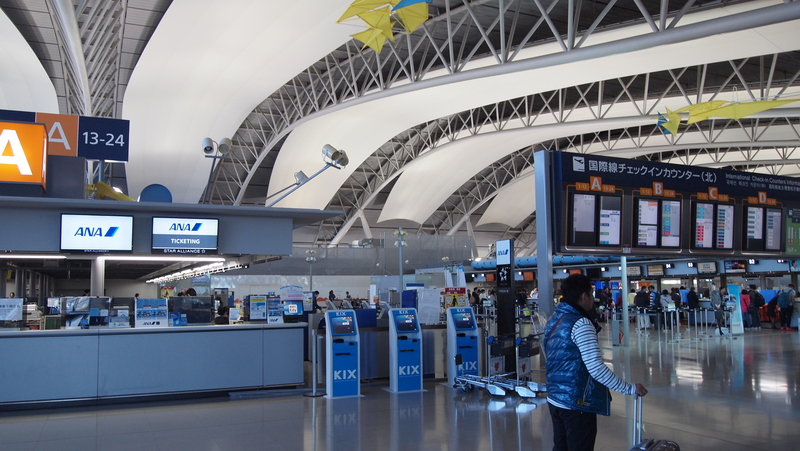 The airport, and terminal is perfectly connected to Osaka, with most trains taking about 35 minutes to an hour from airport to the centre of town and vice versa. 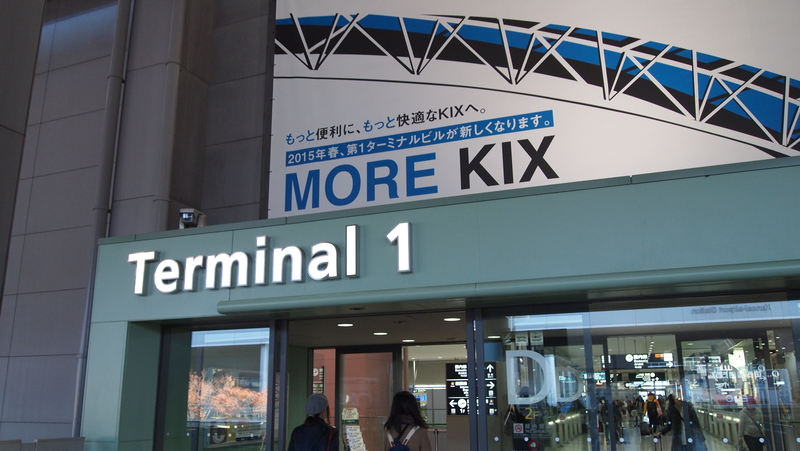 The airport’s Terminal 1 offers a couple of bag drop locations, situated in the Arrivals hall (land side) and are an affordable way of storing your items for the day. Osaka Kansai Airport’s Terminal 1 itself is fairly well appointed land-side with a shopping precinct sandwiched between the arrivals and departures floors (slightly hidden away but worthwhile visiting if you have a few hours to kill.) Apart from this, there is a large departure area on the top floor, with banks of check in desks. 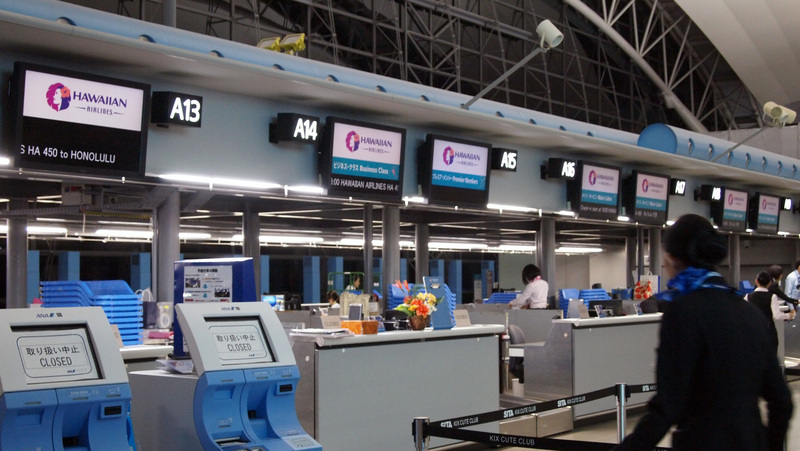 Hawaiian Airlines utilises check in zone B, also utilised by ANA. Hawaiian Airlines opened their desks 3 hours before the flight, and there was already a small queue forming. The flight was virtually full that evening, even though it isn’t the only carrier to operate the route. Originally booked on an Extra Comfort seat, we decided to look into upgrading our ticket after travelling for already 24 hours. 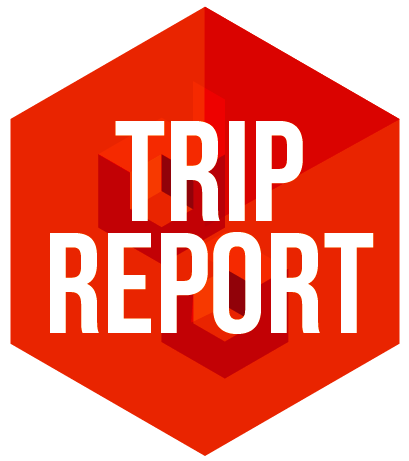 As soon as the check-in desks opened, we made our way to a very helpful agent, who allowed us to upgrade our ticket for a fairly affordable fee. With the upgrade we were allowed to use the lounge at Kansai Osaka, which is operated by ANA, as Hawaiian hasn’t got their own lounge at the airport. The lounge was clean, functional and spacious, but nothing really to write home about. Spending an hour in the lounge, was plenty time to have a quick drink, check my emails and get myself ready for an overnight flight to Hawaii. Boarding commenced approximately 50 minutes before the scheduled departure time. Boarding commenced with their International Business Class guests first, (Hawaiian title their first class cabin International Business when flying outside of the US, however the cabin is identical in product) and on arrival to the aircraft were greeted by Hawaiians famous smiling and welcoming cabin crew, with the female attendants decorated with floral hair pieces. 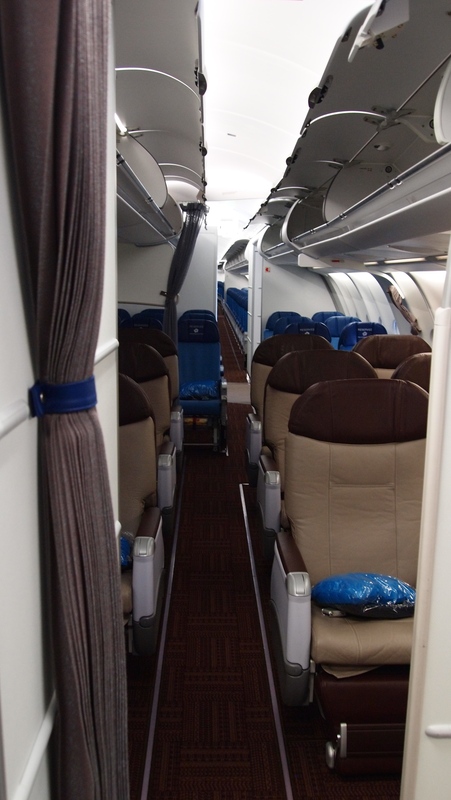 The cabin itself was one of Hawaiian’s newest interiors, which we have covered in the past, with the first three rows of seats adorned in earthy tones, whilst the rest of the cabin features blues and aquas. The seats on the A330 are further spaced apart than on the older 767s that Hawaiian use on some routes, giving a welcoming 42″ of seat pitch, although all longer-haul aircraft offer 3 rows of 2 x 2 x 2 seating. The cabin does feature mood lighting, however the range of colours and effect in a relatively small cabin is limited, yet a really nice touch. 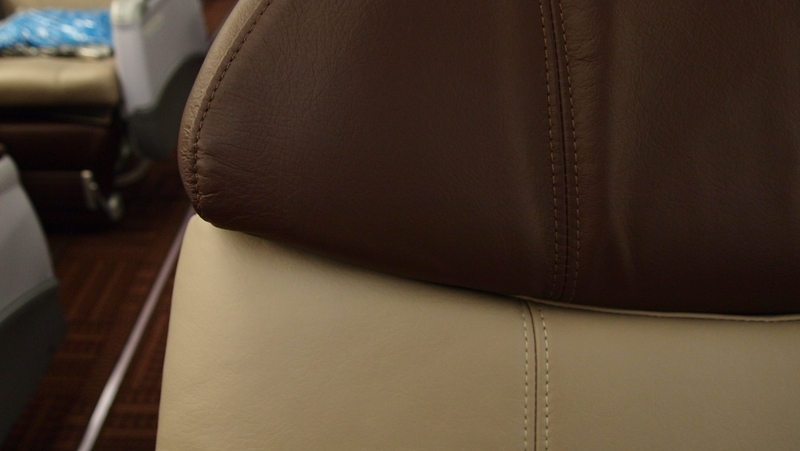 The seats, with the dark brown backs are smart and fully leather, and help create an intimate and sophisticated interior, which breaks away from the seas of navy blue US carrier First Class seats that still fill the skies around North America. The seat itself is well appointed, with a deep recline, leg rest with extending foot rest and large middle table and pop-out slimline hi-def TV screens. 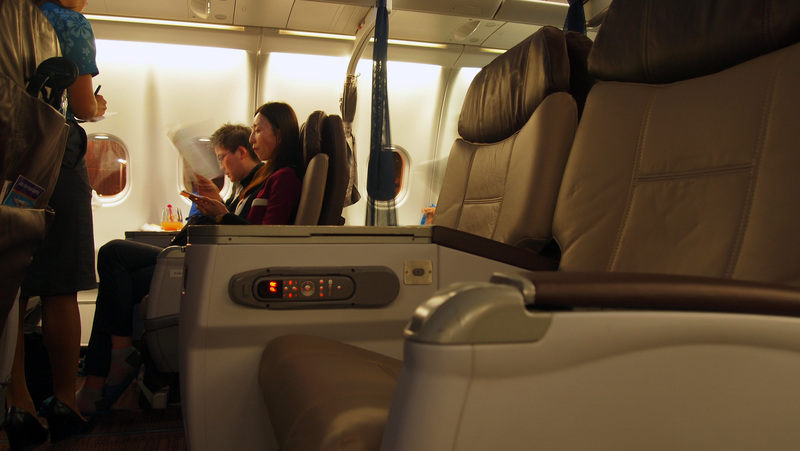 Our only criticism of the flight, is that for overnight, longer-haul trips such as this one, these seats are no-longer on par with international standard for business class comfort. 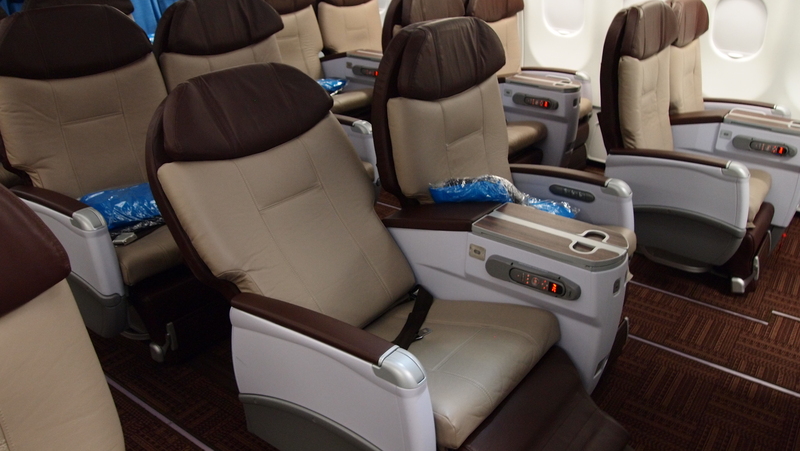 Admittedly, most carriers, such as Korean, or JAL put their older style recliner or angle lie-flat seats on Hawaii routes, as they the Islands are seen more as a leisure destination, therefore not needing such investment to still secure a higher fare. 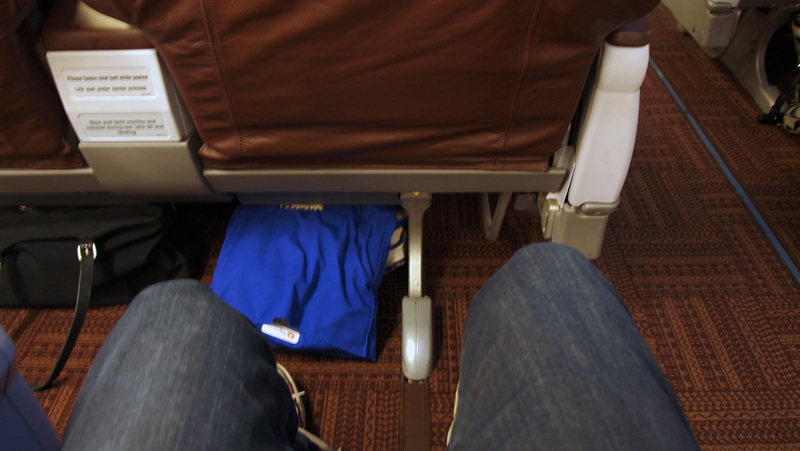 That said, airlines such as paralleled Fiji Airways have invested in lie-flat seats, which with only 18 inches extra seat pitch mean losing one row of economy, would offer much higher First Class comfort, afford a higher premium for the seat and raise the bar against their competitors. We’d actually love to see the carrier invest in fully flat seating, to really raise the bar, and help reinforce the carrier’s reputation as the best US’s domestic airline. All this said, with the deep recline, comfortable blanket and premium pillow we managed to steal a good few hours uninterrupted rest on the short overnight hop. The new entertainment system on the A330’s, as we have mentioned before is excellent. It is both responsive, of high quality resolution and easy to navigate. The TV screens, also being slim-lined means that there is a larger sense of personal space, and makes it easier to pass by when needing to use the restrooms. There is a hand controller, for those wanting to not use the touchscreen, however, it is fairly unnecessary. The controller is also a little close to the thigh area, meaning that when sleeping, it’s easy to brush the controller and wake up the screen. 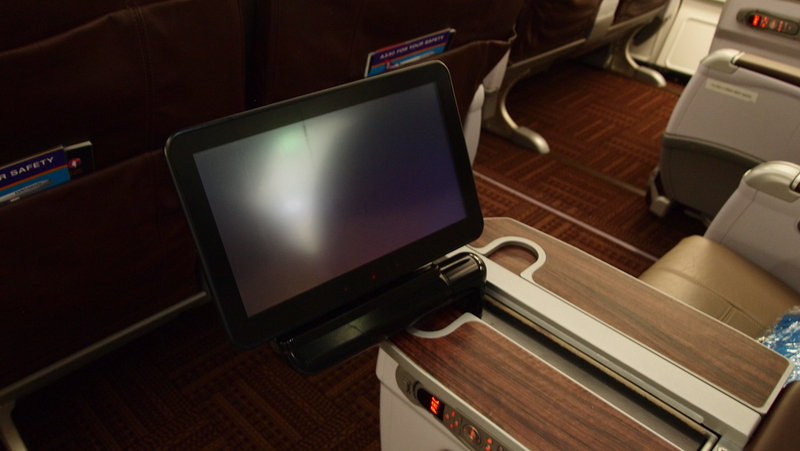 Passengers in the First or International Business Class cabin (and Extra Comfort) have access to the full selection of entertainment on the system, whereas passengers in the economy section have a limited free entertainment bundle and other entertainment is available for purchase individually or in an entertainment bundle. We watched a movie as we ate dinner, before getting some shuteye. 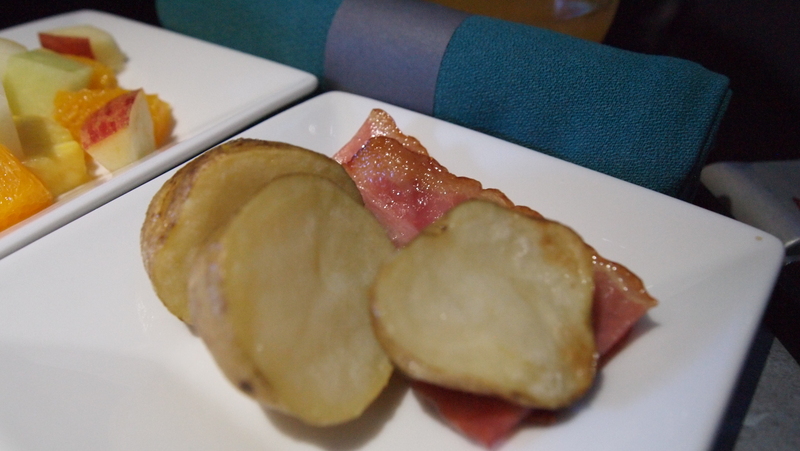 One of Hawaiian’s big winners is their inflight catering, and this trip was no exception. As soon as we sat down we were offered a variety of drinks. We opted for sparkling wine, and after take-off had one of Hawaiian’s signature Mai Tai’s to get into the Hawaiian spirit. Literally. 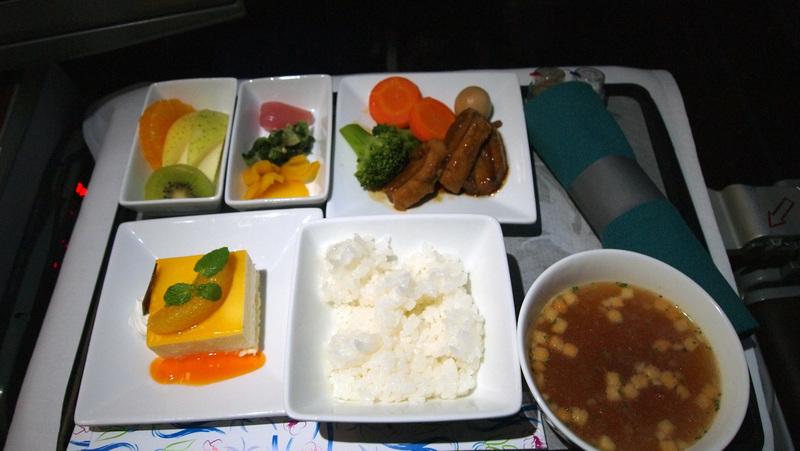 As this was a relatively short overnight trip, the food was fairly quick to come out, and was presented on one plate, to speed up the dining experience. This seemed to thrill all the passengers, who were keen to get some shut eye. 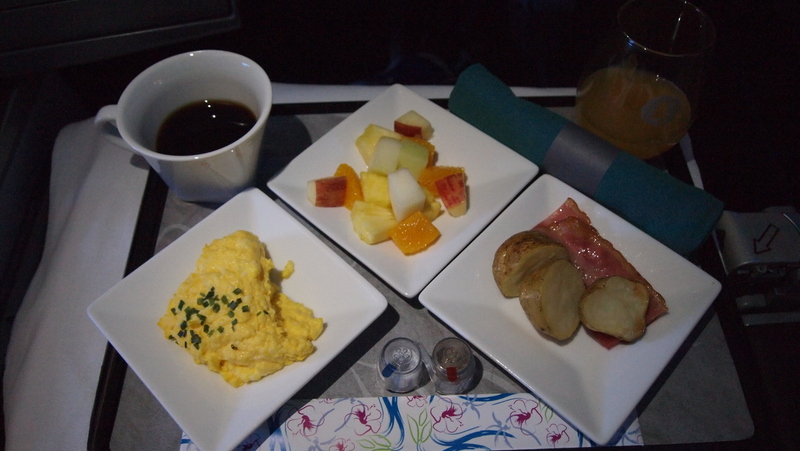 There were no options to pick from, which was a new experience for us, as we loved the Tapas style ordering system which occurs when flying from the Continental US to Hawaii. 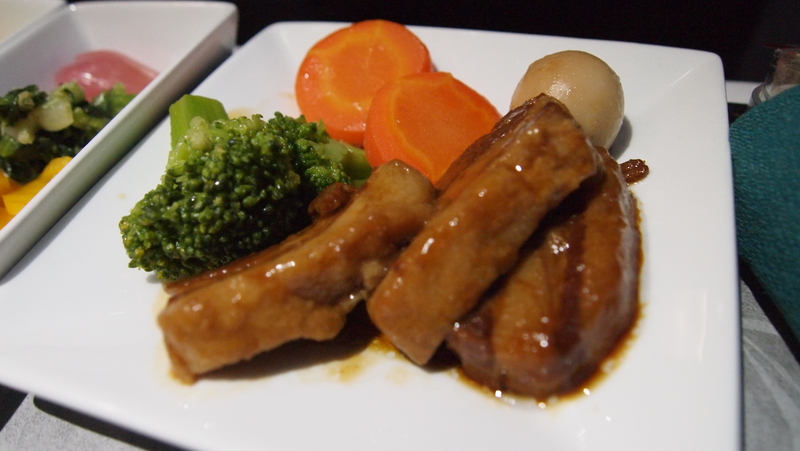 The dinner consisted of an Onion Consume, Braised Pork Belly with Marmalade, Steamed Broccoli, Glazed Carrots and Quails Egg, Steamed Rice, Pickles and Fresh Fruit. The dinner was incredibly tasty, hot and well balanced, and filled us up perfectly for a good night’s sleep. Shortly afterwards plates were cleared, lights dimmed and passengers prepped for the night. Still having a sweet tooth, we asked a passing cabin crew what was on offer, and they brought a variety of snacks for us to choose from. We stuck with the macadamia nut cookies, which are moorish. Approximately 90 minutes before arrival, the breakfast service started up, and this commenced with a fresh fruit juice, which gave us a chance to raise our chairs slightly and prepare for the lovely smells coming from the galley. This was due to the very tasty bacon that was presented along with the rest of the breakfast, which also consisted of Breakfast Potatoes, Scrambled Eggs and Chives and Fresh Fruit salad. Accompanying this, we went for the coffee, which had a lovely Kona Coffee taste to it. (Hawaiian coffee is some of the best, and strongest, around) The breakfast was also incredibly delicious. 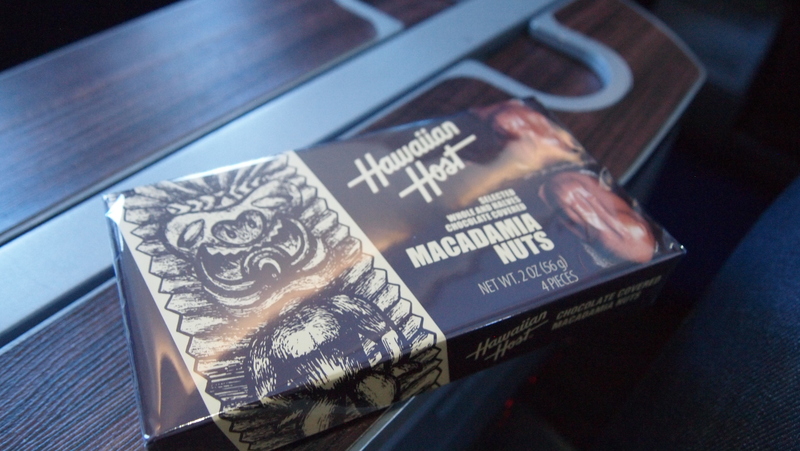 Then, just as we think the food service was finally over, and we were mid decent with the islands in sight, the chief purser came around offering each passenger a box of chocolate coated Macadamia nuts, which didn’t last long after arrival. We love these – and had to go buy more! Hawaiian have two extras offerings, depending whether you travel internationally or domestically. The better is the international offering, whereby the carrier offers premium cotton pillows, slippers and thick Hawaiian Quilt. Passengers in the International Business cabin also receive noise cancelling headphones, which aren’t the best, but a welcome addition. Passengers also receive an amenity kit, which is perhaps unique in the way that every product inside is branded Hawaiian Airlines (kind of cool). The amenity kit features eye mask, travel headphones, eye mask, ear plugs, dental kit, moisturiser and lip balm. It also comes in a cool aqua netted bag, perfect for storing bathroom essentials, long after the flight is over. 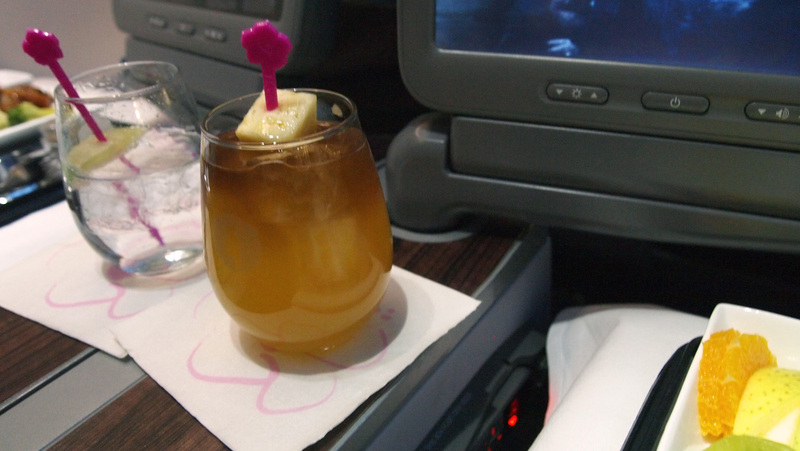 Hawaiian Airlines International Business Class is a great, and affordable way of travelling across the pacific, and whilst the seats may not be as great as other Business Classes around the world, the service quality and dining options more than make up for it. Hawaiian are by far one of the best domestic carriers in the US and they offer a decent international product too. As far as ways of getting to Hawaii go, Hawaiian would still be our preferential carrier. There are some exciting developments rumoured just around the corner, and we hope these developments are what pushes the carrier, especially its premium cabin to the next level. fake. the entertainment monitors in the pictures are different. How was the flight experience. As l am doing the same thing next month. Airline doesn’t seem to get the best reviews. How was yours.